Q&A: Why are there less Mint error coins in circulation now? 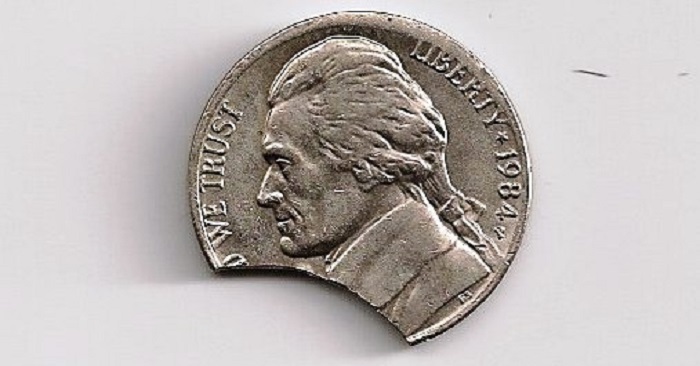 An example of a clipped planchet, a type of Mint error that is increasingly less likely to occur. Photo by economicrealist. Q: Having been a casual collector for many years, I am puzzled by the fact that minting errors that seemed to have been in plentiful supply 20 to 25 years ago are today typically priced near or just above the three-digit level. Why is this? A: The short answer is supply and demand. Specifically, the supply has tightened parallel with a significant increase in demand. In the late 1990s, the U.S. Mint’s processing equipment and methods were enhanced to the degree that the emission of gross off-center and multiple strikes, along with clipped planchets and similar defective products, decreased dramatically. At the same time and subsequently, the number of collectors pursuing these minting mistakes increased substantially. Back in the 1960s and 1970s, coins displaying die cracks and breaks were the centerpieces of most collections and were typically priced at $1 or less. Major die breaks took years to climb past the $20 level. Today, almost any highly visible minting error variety has a base value of at least several hundred dollars. With demand far exceeding supply, prices have been driven up dramatically from the perspective of 25 years ago. Q: I have heard the term “waffled” coins used. What does it mean? A: Commencing in 2003, as an extension of its quality control program and to allow fewer error coins to reach the marketplace, the U.S. Mint instituted the use of machines into which coins screened out of production during the quality control process were fed under high pressure between pairs of rollers, distorted the surfaces of the error pieces into an appearance somewhat akin to that of a “waffle” prior to the scrap being shipped to outside vendors for melting. This process has had the effect of greatly reducing the number of error coins—multiple struck and off-center coins, blank and clipped planchets, and other scrap reaching the marketplace. Although waffled examples of all denominations struck for circulation are known for all years from 2003 on, the Mint has not objected to their being traded because they are not considered coins with legal tender status. The machines for this process were originally developed in Austria, in advance of the conversion to the euro in 2002, to handle the retirement and recycling of the circulating coins of its predecessor individual national monetary systems. Q&A: Are oddities, varieties, and errors still considered valuable when collecting current United States coinage? Lunch with. . . Ken Bressett Q&A: What separates Proof sets from Mint sets? Q&A: What kind of collection do I have?